Laugo Arms Alien 9mm Combat/Tactical Pistol: Delayed-Blowback Gas Piston and Slide Operate ABOVE the (Fixed) Barrel, Providing Ultra-Low Bore Axis! | DefenseReview.com (DR): An online tactical technology and military defense technology magazine with particular focus on the latest and greatest tactical firearms news (tactical gun news), tactical gear news and tactical shooting news. 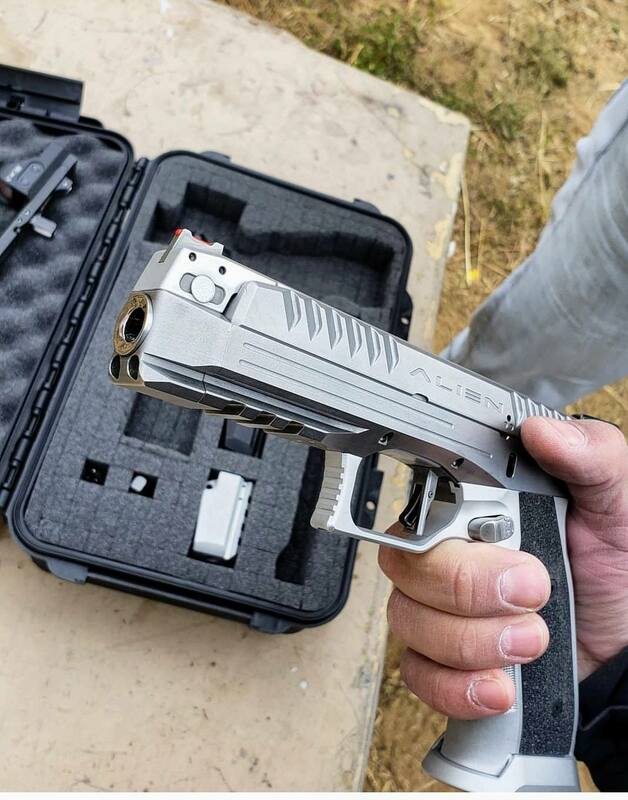 Laugo Arms Alien 9mm Combat/Tactical Pistol: Delayed-Blowback Gas Piston and Slide Operate ABOVE the (Fixed) Barrel, Providing Ultra-Low Bore Axis! Over the last two years, DefenseReview’s (DR) published a couple of articles on variants of the CZ Scorpion 9mm weapons system, including the CZ Scorpion EVO 3 S1, CZ, Reflex-Suppressed CZ Scorpion EVO III Micro S2 Reflex, and CZ Scorpion EVO 3 S2 Pistol Micro with Arm Brace, since it’s an interesting modern, modular combat/tactical 9mm select-fire SMG (Submachine Gun) and semi-auto-only carbine/SBR (Short Barreled Rifle)/pistol system manufactured by a major firearms company we respect. However, we’ve never really written about Laugo Arms Czechoslovakia, the actual design firm behind it. Well, now we are, because Laugo Arms recently introduced a rather fascinatingly-designed gas-piston-operated delayed-blowback, fixed-barrel semi-auto 9mm (9mm Parabellum/9x19mm NATO) combat/tactical pistol, called the Alien, appropriately enough, that sports an extremely low bore axis, and is the first such pistol we’ve seen since the Heckler & Koch HK P7 series pistols, pistols that are very close to DR’s heart, since the HK P7M13 was your humble correspondent’s first pistol he every bought (while still in college), and first concealed carry (CCW) pistol, before discovering and switching over to the G19 (Glock 19). Back in very late June, Recoil Magazine published a nice heads-up piece on the Alien pistol that covered the broad strokes. According to the piece, the Alien will utilize a proprietary 17-round magazine, giving the end-user 17+1 rounds of firepower with a single mag. Not bad. 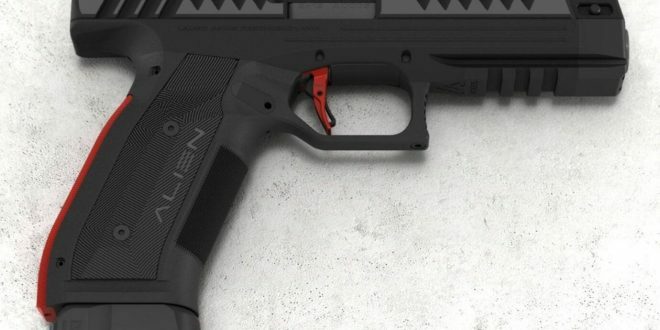 The piece also states that the Alien pistol is scheduled to arrive in the US market sometime in 2019. However, the some of the best info DR’s seen on the Alien pistol really comes from Polenar Tactical’s video on it, which shows the pistol’s shooting characteristics and internal components and operation. Polenar did a nice job with it, and you can watch it below. The video very nicely shows what’s so important about the the Alien pistol, namely its ultra-low bore axis, made possible by the Alien’s unconventional design, which places the gas-piston-driven delayed-blowback operating system, recoil spring and slide ABOVE the barrel, which is pretty cool. Another surprising aspect of the Alien pistol is that while it looks like it would be a striker-fired pistol, it’s actually hammer-fired, utiliing a downward-swinging internal hammer. Assuming the pistol actually works (reliably, accurately and durably) under adverse conditions at high round count, it’s a pretty ingenius design, and arguably a historically important one. When watching the video, notice how little muzzle flip, or muzzle rise, the shooter experiences. The ultra-low bore axis creates more straight rearward recoil forces, and thes less upward movement. However, we should perhaps note that DR writer/contributor and chief new-product tester Jeff Gurwitch is a bit skeptical of the Alien pistol, based on its design. 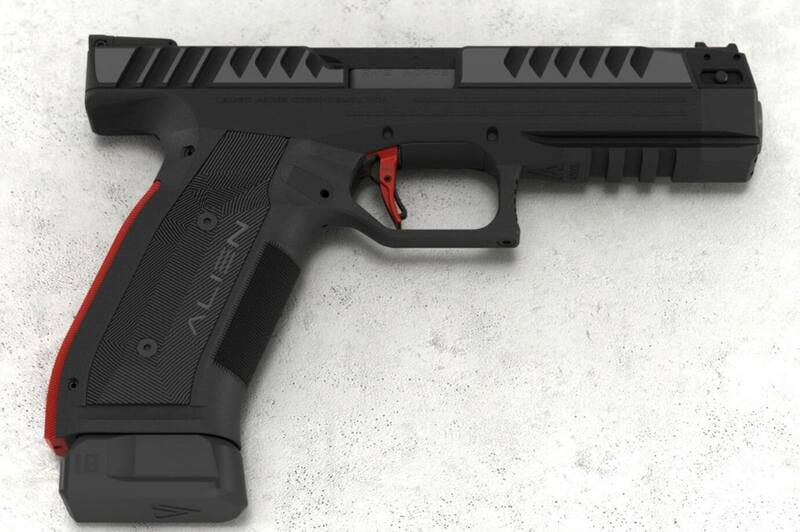 Gurwitch is a bit doubtful that the Alien pistol will be able to hold up under high round count, and points out that most, if not all, new pistol designs have teething issues, let alone unconventionally-designed pistols like the Alien. Gurwitch is also of the opinion that the Alien will need roughly 5 years of proof-testing to be considered trustworthy for combat. Anyway, hopefully, Laugo Arms will introduce a compact model, along with the full-size model. In the meantime, Defense Review will try to follow any/all Alien pistol developments. We’re hoping Laugo Arms will be at SHOT Show, so we get to handle (and possible test-fire) it. Editor’s Note: DR digs the Laugo’s logo for the Alien pistol (see above, right), as well, and we hope they get to keep it, since it’s a spoof of H.R. Giger’s Alien monster design. Previous: Nightforce Optics ATACR (Advanced Tactical Rifle) 1-8X First Focal Plain Tactical Riflescope Wins USSOCOM Squad-Variable Powered Scopes (S-VPS)-Contract!